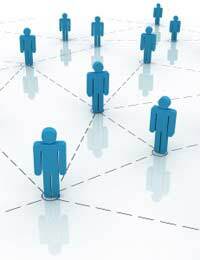 Networking is a great way to help further develop your career and to generate business. But it can also be time consuming so it’s important to network in the right way and with the right people. Therefore it’s important to do some research and some planning to make sure your getting the most from your network. Below is an Action Plan to help you get started with your network. Your network is the group of people - colleagues, clients, business associates – that you have developed a good working relationship with. These are people that are useful to discuss ideas, industry developments, and if they are internal to your company, are likely to be the people that can provide you support. people that you mix with on a regular basis and keep you up to date on company changes. It’s likely that you will need to gain the support of others during your career, whether they are assisting you on work, providing a casting vote on a decision, or are interested parties on a project, these are important people that can affect the outcome. Action Plan: Consider the various functions within your organisation, that you typically work with. Who are the key people within these functions? Consider those people that are key but which you have little contact with at the moment. These are people that can help keep you up to date with your particular specialism or industry. Or they may be people that you’ve worked with that you know are reliable. Action Plan: Draw up a list of your existing contacts and what their field is. Rate each by the strength of the relationship. Consider those relationships that need improving. Do some research and see if there are relevant specialist groups that you could join. It’s hard work and time consuming maintaining a current and active network. There are many opportunities to main internal work relationships. Face to face meetings are important, so don’t just rely on emails and the telephone, and equally don’t always meet in formal situations. Having a chat over a coffee can be more relaxing and a better way to get to know each other. Having regular contact is important. If people feel that they only see you when you want something they are not likely to be that helpful. Equally, it’s important that you give as well as take, in the relationship. External Networks have less opportunities to meet, however with the advent of online social networking sites (such as LinkedIn) it is possible to stay in contact. Special Interest Groups (such as those run by the BCS, British Computer Society) provides opportunities to meet other people would work in similar fields. Most industries have similar organisations. Action Plan: Take the top ten contacts from both your internal and external network. Rate the strength of the relationships. For those that are weak come up with some actions to improve the relationship. While there is nothing inherently wrong about approaching someone in your network with a business proposition, do so with care. Remember that people do not want to feel that you are using your relationship simple for a business gain, however if you honestly feel that working together could be mutually beneficial then put your idea to them. But remember, this is your network, so don’t be too pushy or sales-like in your approach, or people may hesitate to have contact with you in future. It’s likely that you will have meet many people during your career, people that you’ve enjoyed working with and fostered a positive working relationship; you’ve helped them and they’ve helped you. These are the people that can help you in the future, providing you with advice and support, and sometimes someone just to run an idea past. Maintaining these relationships is what networking is all about.